The news that Hello Kitty isn’t actually a cat hit the world pretty hard. Frankly, it’s made me question my lifelong relationship with Sanrio (which can never be severed tidily since I have a small, two-decade-old, blurring non-cat inked on my upper arm). Ignoring problems and focusing on something else instead is always a great way to deal with them. 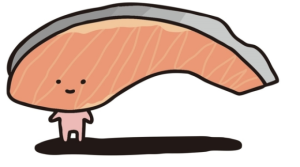 Let’s look at Sanrio’s best food-related characters, which may or may not actually be food. Ok, this boy (?) 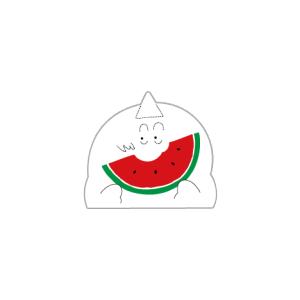 with a strawberry on his head isn’t top five objectively. However, props must be given because this is old-school Sanrio circa 1975 and likely the brand’s first food character. The genre had not been perfected yet. The ’80s were a strange time. I couldn’t decide between this watermelon chomper or this plate of eggs and indeterminate vegetables called Party a la Cart. Either way, party on. This whole collection wins at Sanrio-ness. Dokidoki Burger is the ringleader, as anthropomorphic burgers tend to be. There are also some chicken nuggets a.k.a. chums, a shake, a hot dog, and the above girly box of fries. Doikidoki Yummychums might not be high in name recognition, and yet that has not prevented at least one tattoo from appearing in the world. Leave it to the anthropomorphic salmon filet to take top honors in a 2013 Sanrio contest to choose new characters based on Japanese food. It’s hard to believe that a lazy egg with distinct buttocks would only make it to first runner-up in the above mentioned contest, but really it’s kind of brilliant since losing is staying true to the character’s unmotivated persona. 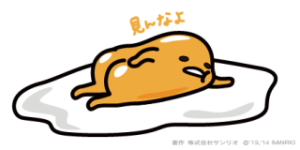 Gudetama does not even appear on the American Sanrio site. Luckily, there is an active Twitter account that doesn’t really demand knowledge of the Japanese language to appreciate. Bonus Gudetama video that will nearly make you forget about the existence of Hello Kitty.